New item in original packaging. 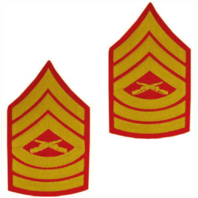 United States Marine Corps (USMC) chevron gold embroidered on red MSGT Master Sergeant. Priced per pair.